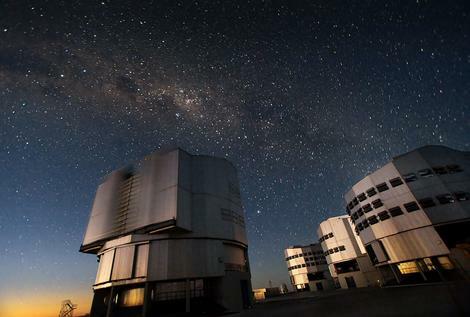 At ESO’s Very Large Telescope (VLT) in Chile they are about to fit a new instrument called KMOS that can record the light from 24 galaxies simultaneously. KMOS has 24 robotic arms tipped with gold-plated mirrors that can be trained on a different galaxy — each arm has almost 200 facets making them rather like an insect’s compound eye. Light from these mirrors is channelled into 3 spectrographs and ‘multiplexed’ — combined into a single signal. Working at infrared wavelengths, KMOS will probe a crucial time in the evolution of galaxies: around 10 billion years ago when star formation was at its height and the black holes believed to nestle in the centers of most galaxies were also highly active. KMOS can detect emissions from gas at very early times in the history of the Universe, which are normally invisible in images of the sky. The light from gas at high redshift can be concentrated in emission at a single wavelength, so when an image is recorded over a broad range of wavelengths, this light can be swamped and not detectable above the background glow. Because KMOS spreads the light out in wavelength over an area of sky, it can potentially detect the sharp emission lines from the most distant gas known.